Everything is covered in pieces of plastic to protect it during shipping and those thin strips are taped to the tray. 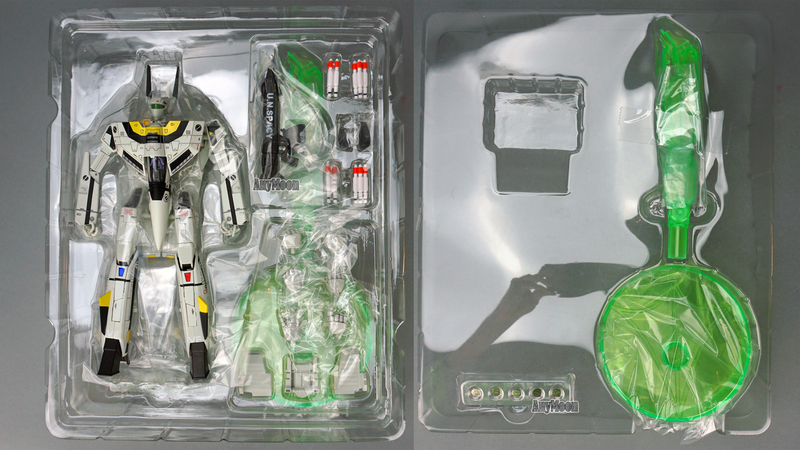 The battloid mode toy has pieces of plastic shoved into every cavity. After you remove all the packing materials you’ll need to peg the hips in and install the heatshield. I greatly prefer instructions that are books compared to the never-ending piece of paper technique employed here so I’ve provided a scan I think is more user friendly. I found it a little odd that the instructions were mute to the display stand. Before I gush about how pretty battloid is, let’s start off with some critical notes. The backpack sits up VERY high and doesn’t tuck tightly enough against the toy’s back. 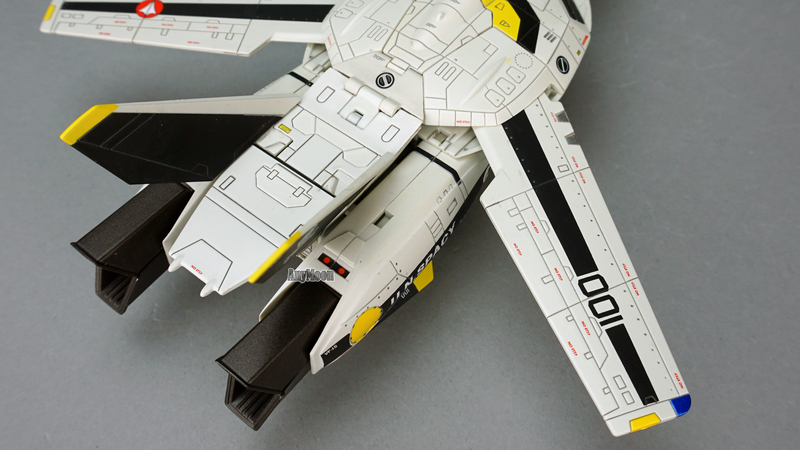 The vents at the bottom edge of the chest are rather large. Given the overall size of the toy, it wasn’t surprising to me that the spot lights in-set from each shoulder are simply painted yellow instead of being translucent plastic. The integrated hands, while impressive in their functionality, look a little off but the included fixed-posed hands look tremendous. Moving on to the positives, the paint work is superb. 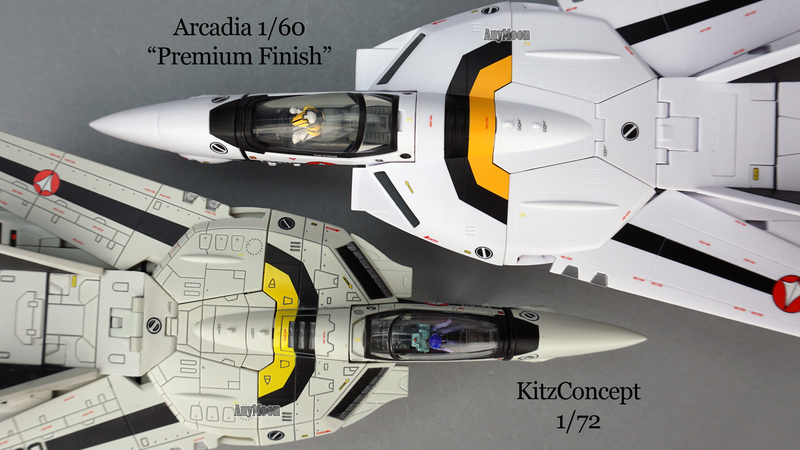 This toy is what Arcadia considers a “premium finish” and then some with panel lining and seemingly more paint applications. There are plenty of nearly microscopic but legible “No Step” signs, “DANGER”, and even the white “VF” right above the foot which is done wonderfully subtly. Guardian mode has some design issues and it’s also the first place you’ll see that the head hangs a little low when not in battloid. 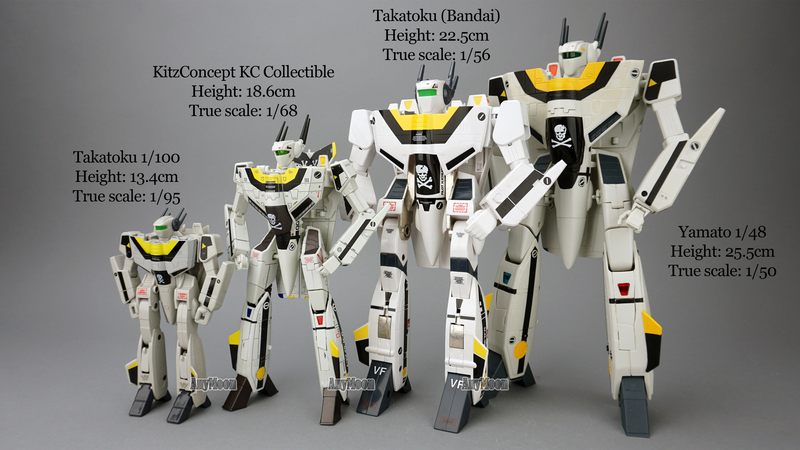 If you’re comfortable with the old Takatoku/Bandia chunky toys, then this shouldn’t be an issue for you,. Like battloid mode, the backpack also doesn’t tuck in as tight as you would want it to and there’s no antenna; optional part or otherwise. Various design issues also hinder the overall look of guardian but we’ll address that later. 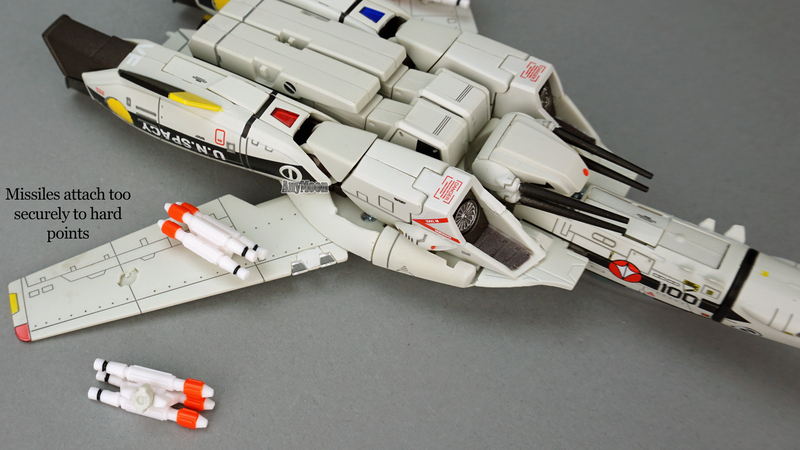 If you didn’t already think this toy had crazy painted detail work, you certainly will when you remove the nosecone to install the batteries and find more painted detail underneath. 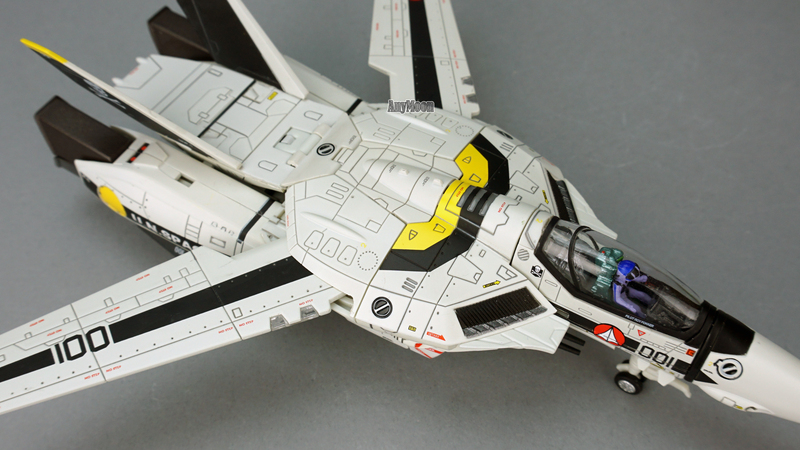 Clear plastic inserts were used on the leading door for the rear landing gear and the lights nearest the body on the wings and look great. 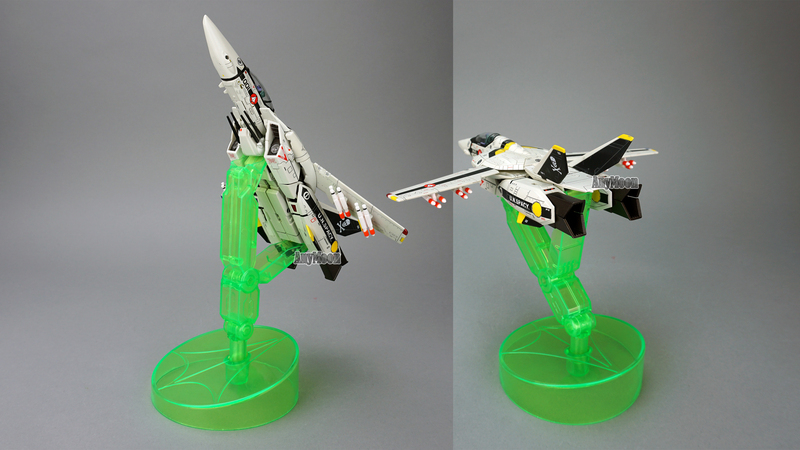 The landing gear aren’t very pretty and if you’re used to the missiles on these toys being the same hue as the craft, you probably won’t like the pinkish white used here. 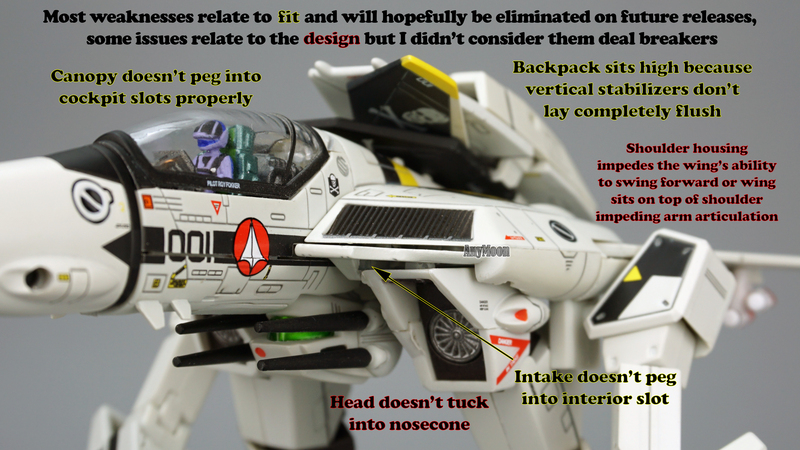 While fighter mode overall is very attractive, there does appear to be a slight angle upward on the legs and a bit too much downward angle on the backpack. You can bend the knees a bit to lessen the effect of thrust pointing up but this makes the backpack point down harder (and be careful as you massage this angles as the legs are pegged into the backpack). 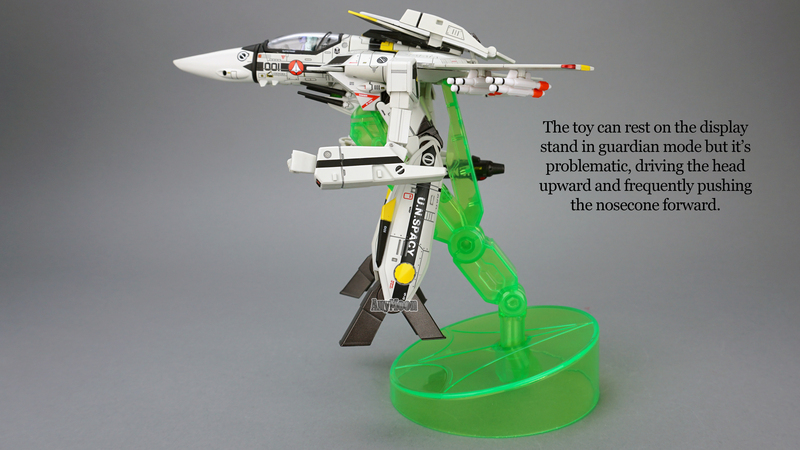 The display stand is an awful neon green contraption with a UN spacy kite molded into the base. The cockpit light button is in an awkward location under a sheath on the nosecone. This makes turning the light on and off more effort than you would hope. A way better solution would have been to make the button be the little antenna stubs that point out from under the nose. 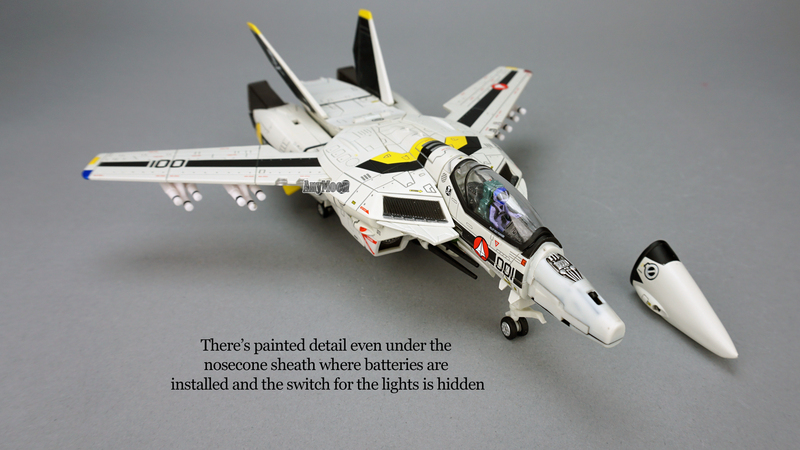 Similarly, the button for the light in the gun is tucked in front of the trigger but this area is very difficult to access if the gun is installed in fighter mode. A better solution would have been to make the round part on the top of the gun be the button or to place a button at the back of the gun. 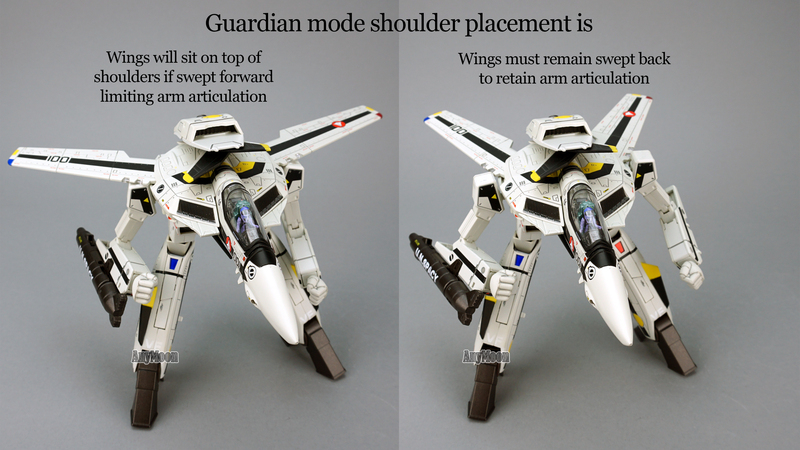 1) While you can squeeze the shoulder just under the wing in Guardian mode, it completely inhibits articulation at the shoulder, including the arm’s ability to angle away from the body. If you want dynamic arms you’ll need to keep the wings swept back behind the shoulder. 3) Despite having an extension gimmick at the knees, there isn’t enough forward bend at the knees which hinders guardian mode. Perhaps this is something that can be improved on subsequent releases. 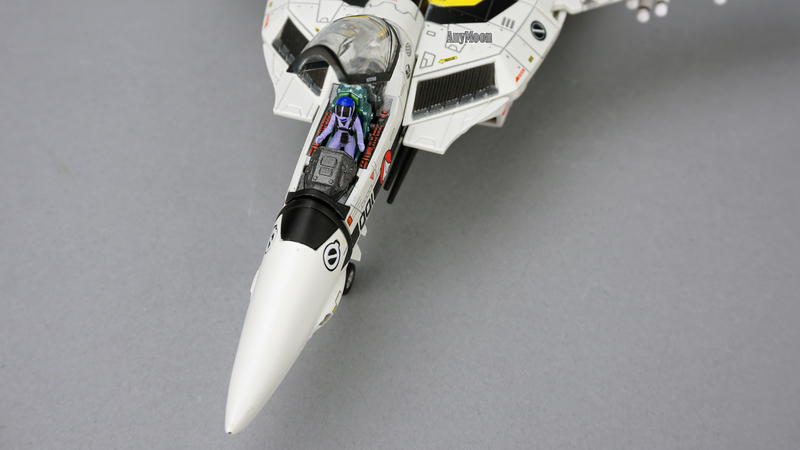 4) The intakes don’t lock properly in position in fighter/guardian modes. While I’m going to list this here, I’m not going to ding the score yet because this may be a first edition build quality problem. If KC can’t address this on future releases, I’ll probably change it to a design flaw. 5) As mentioned previously, the backpack doesn’t tuck tight to the back of the toy as it seems the stabilizers can’t lay flat against each other. Again, I’m going to consider this a build issue, for now. 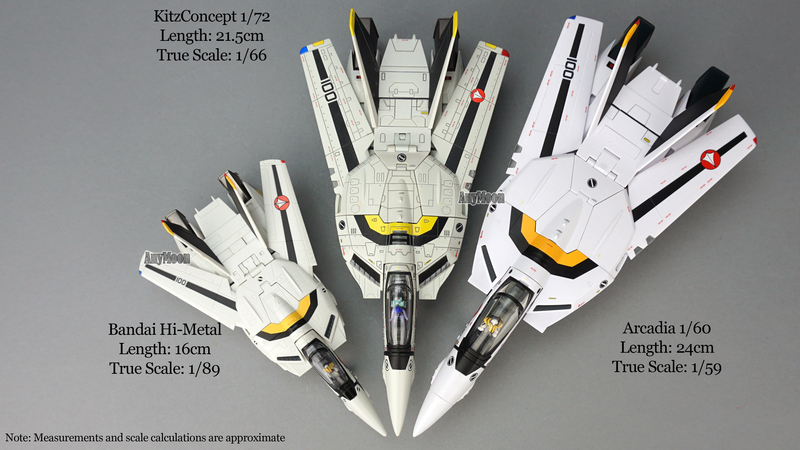 6) The vertical stabilizers have an annoying habit of getting skewed when folded. 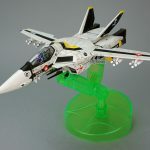 7) Though not surprising given the scale and the light-up gimmick, the gun has a grip that must be removed to be stowed in fighter mode so the gun is not perfect transformation. The strap must be removed as well but using the strap is entirely optional so that’s fine by me. 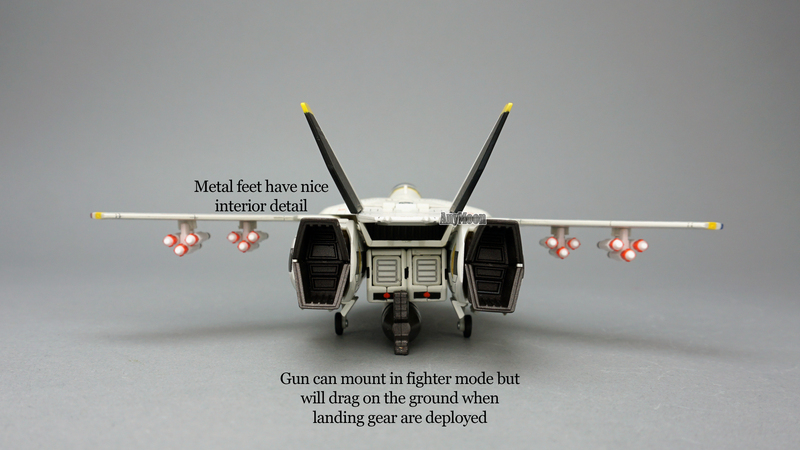 8) While the gun can be stowed in fighter mode, the toy will then sit on the gun as much as it will sit on the landing gear. Fortunately, it still lies flat and isn’t so tall the landing gear won’t touch the ground. Not a grievance yet but there doesn’t seem to be any method for locking the backpack in position. 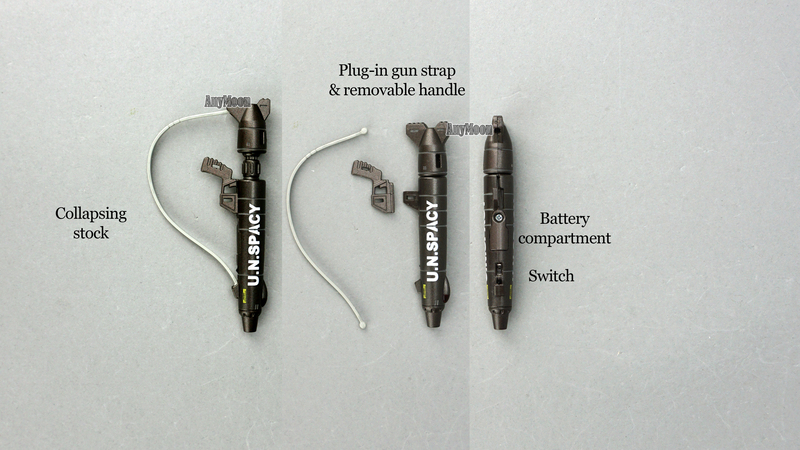 It will be interesting to see if KC incorporates this into the accessories some how or just relies on what seems a pretty stiff joint to handle the load. 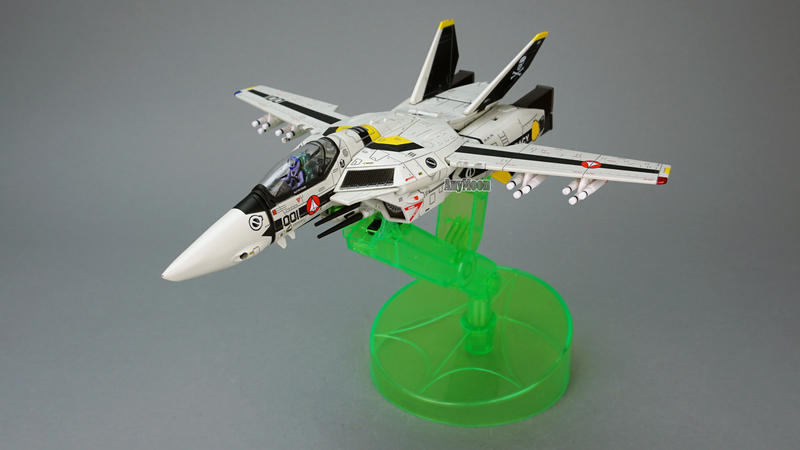 9) The included display stand seems intended for fighter mode only and is incredibly awkward when the gun is installed (tip: install the gun into the stand first, then install the gun and stand to the toy). The front tab doesn’t seem to be the right shape to plug securely in and applying any pressure slides the nosecone forward. 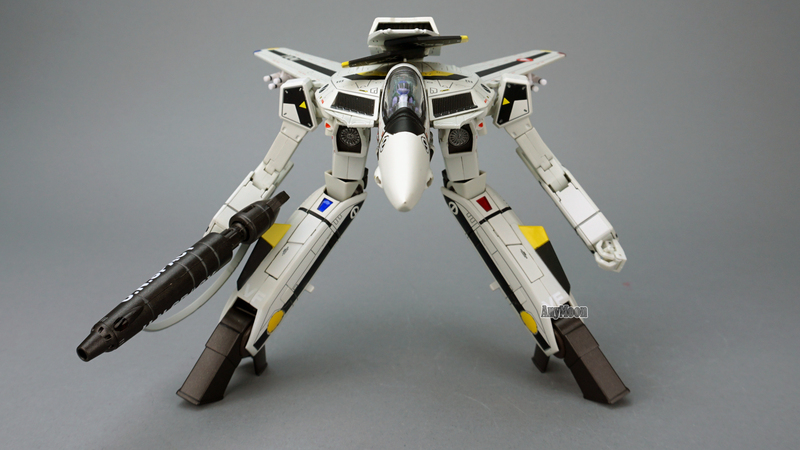 Even when loosely attached the clasping connection does allow the toy to be pivoted with the nose far up making it a little more effective than the usual included display stand. You can use the display stand as a prop in Guardian and Battloid modes but it doesn’t really connect to the toy. 1) TIGHT joints: Out of the box, I could barely move many of the joints. While sometimes that’s a good thing, it can be very dangerous as the joints connect via thin pieces of plastic that could be broken when torqued. Be very careful freeing the joints and try to put them all through their range of movement a few times before you start handling more casually. 2) Loose joints and fit issues: My toy had only one part I would consider loose, the thumb on the left hand seems like it could fall out any moment, but it hasn’t yet. There’s also a fit issue in that hand that makes it not want to stay in a fist. 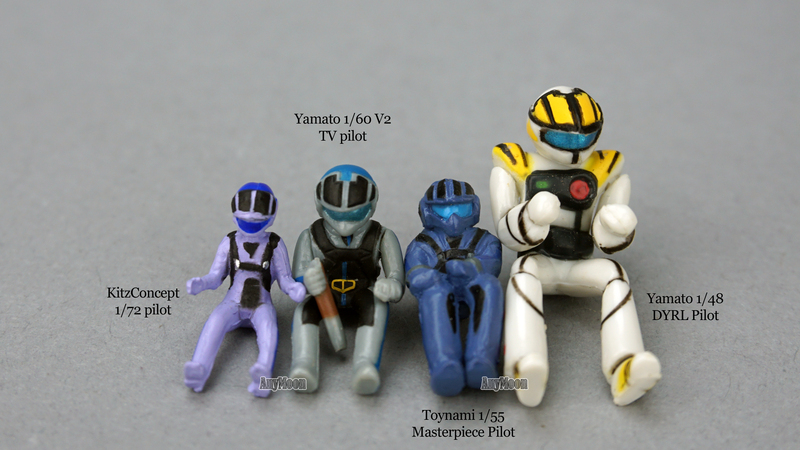 3) Paint scratches: I did find some minor paint scuffs and this will be more frequent as the toy is handled enjoyed. There’s a particularly vexing paint scratch right on the tip of my toy’s nose which you would think would be bare plastic so it seems the whole toy has a thin coat of paint to get the metal bits to match with the plastic bits. 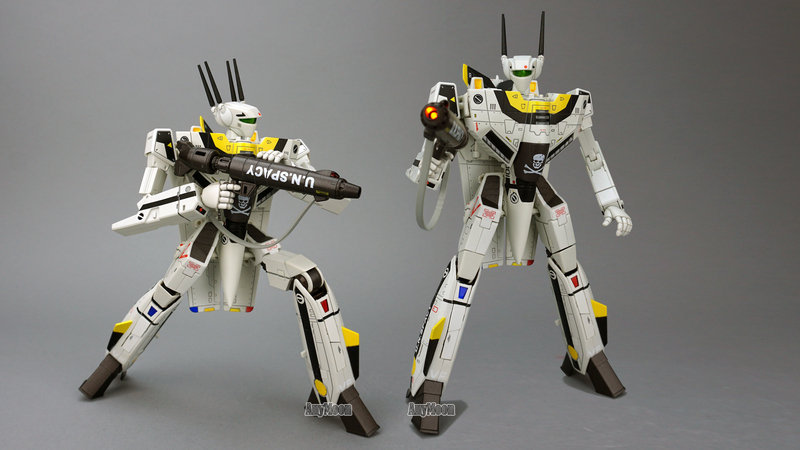 Of particular concern is the paint on the vertical stabilizers that rub against the nub on the toy’s back in battloid and guardian modes. 4) Build quality/tolerances: As mentioned above, I believe there’s a build issue with the front pegs of the intakes that prevents them from properly tabbing into position and causes the intakes to more easily be jostled free. Hopefully this is the result of the peg being a little too large (or the slot a little too small) and future releases will address this. 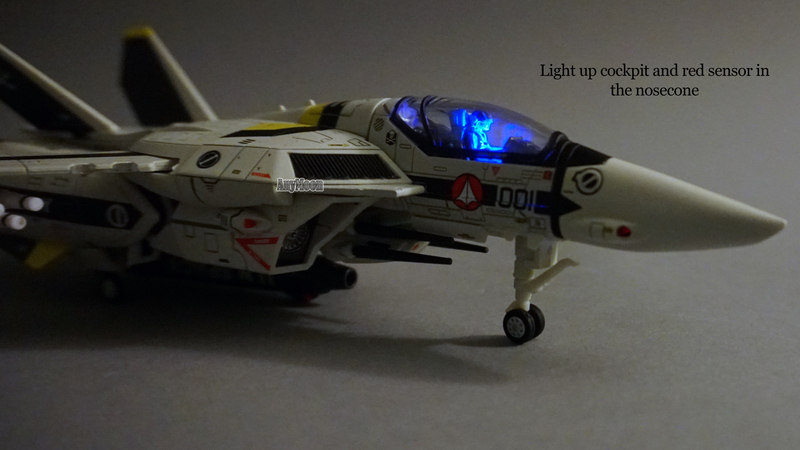 Similarly, I can only fit two of the three batteries for the light-up cockpit gimmick into their housing. I believe the contact at the top of the housing is just a little too large for all three to fit (fortunately, the gimmick still works with two batteries, probably just dimmer). I also have a fit issue with my canopy, there is a tooth on either side meant to help secure the canopy in place but the tooth doesn’t line up perfectly with the slot so the canopy doesn’t sit flush and opens up if the toy is flipped over. 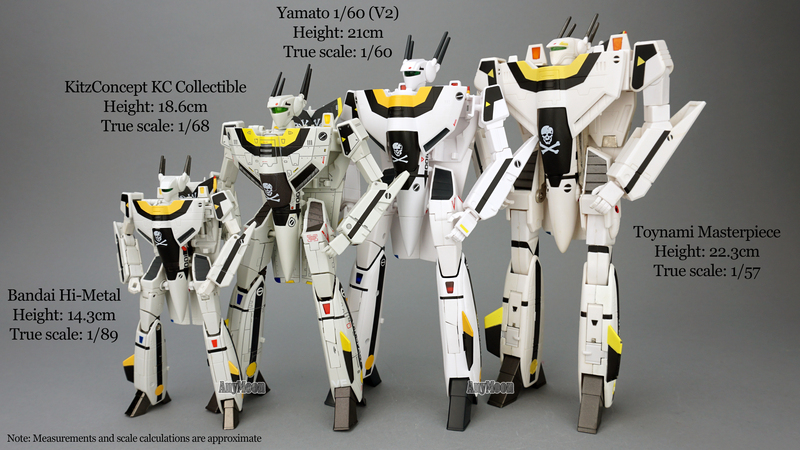 5) Hard points: Like much of the transformation, KC also borrowed the hard point design from the wings from Yamato’s V2 toys. 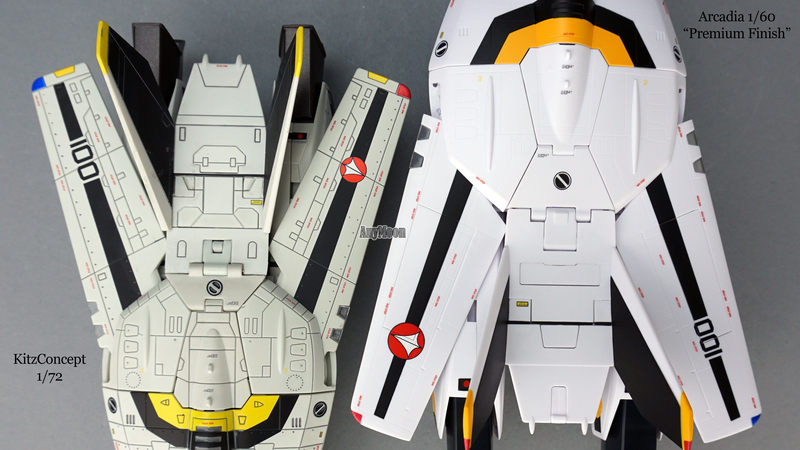 Those hard points are an over-reaction to Yamato’s failures on their 1/60 version 1 and 1/48 toys to keep the missiles attached and feature a twist locking mechanism that has proven a durability problem on those toys and now these toys as well. The missiles lock on so securely that removing them, or even installing them, can sometimes cause the hard point to be sheered off. On the first four I installed, two of mine were sheered off when I went to remove the missile. I’ve seen other people suffer worse fates. 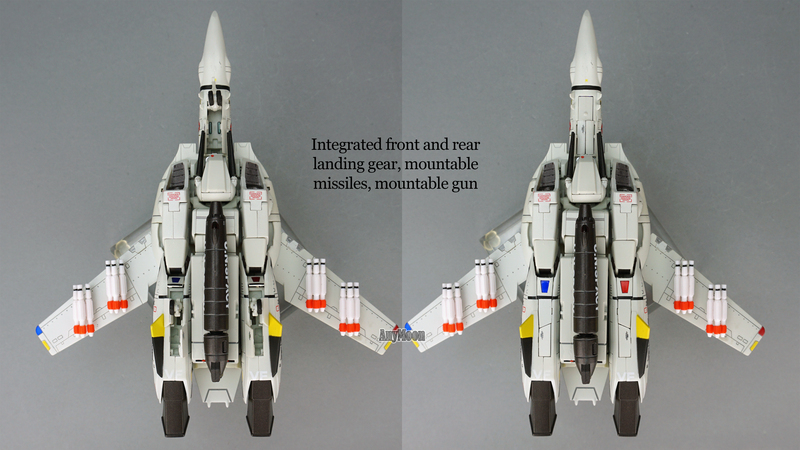 It seems it would be an easy fix to have the missiles attach a little less securely. Starting at the top, the head is on a ball joint. The shoulders allow full rotation but, as mentioned previously, they can’t get out of the way of the wings in Guardian mode. There’s the familiar twist at the bicep and a double-jointed elbow that offers a truly impressive range of movement. The hands peg in so they can rotate and the integrated hands are nicely articulated and do a great job holding the gun. 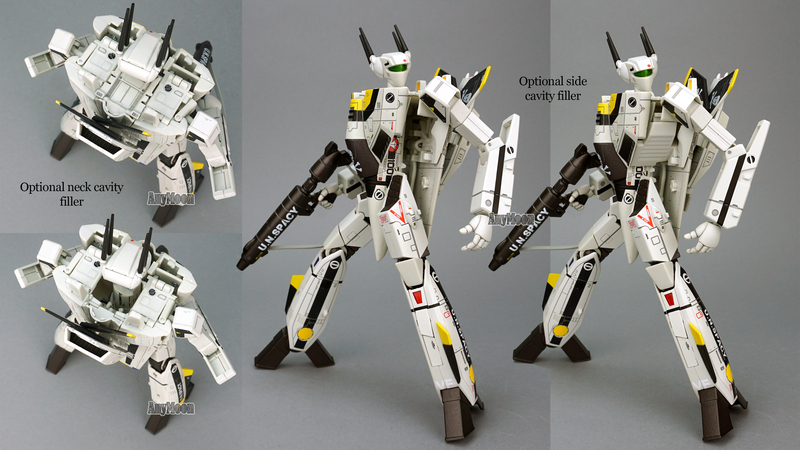 You won’t get a waist and there’s no gimmick to get a wider stance but the hips do attach on firm ball joints which allow the leg to rock and/or pivot in/out as well as rotating forward and back (assuming your wings don’t get in the way). The guardian joint is present and offers a standard range of movement. The knees, when extended, allow you to go 90 degrees back but, as mentioned previously, they do a poor job bending forward for guardian mode. 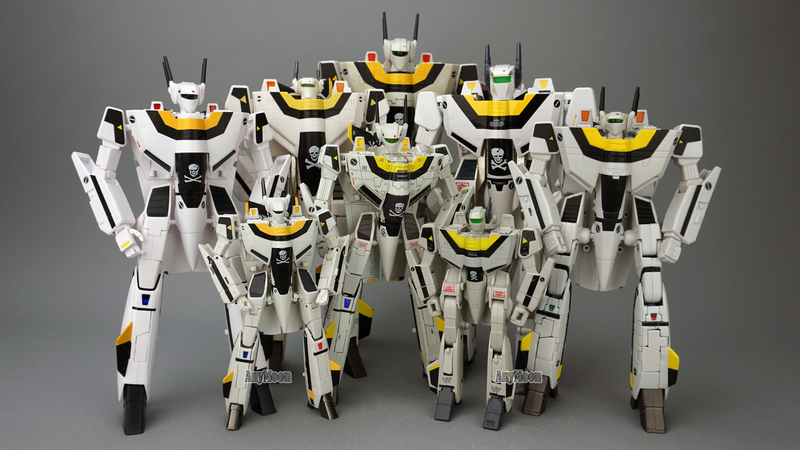 The ankles do a great job extending and allowing the toe to move up or down but you won’t get much rocking left/right or twisting like you would on something like Bandai’s 1/48 DX toy or a toe that simulates that ability like the Hi-Metal figures. Most first releases suffer from a few bugs and this is no different. 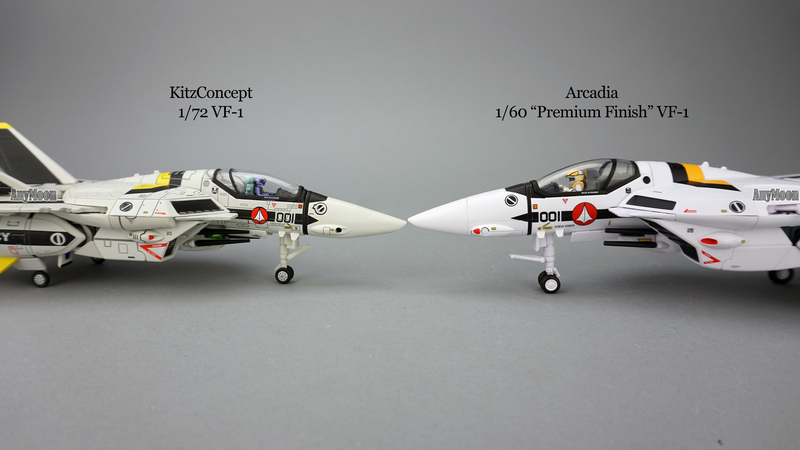 If KC can get the vertical stabilizers to lay flatter, the intake to peg-in as intended, the missiles to be removable without damaging the hard points, and get one more click of forward sweep from the knee then they’ll be in really good shape for future releases. 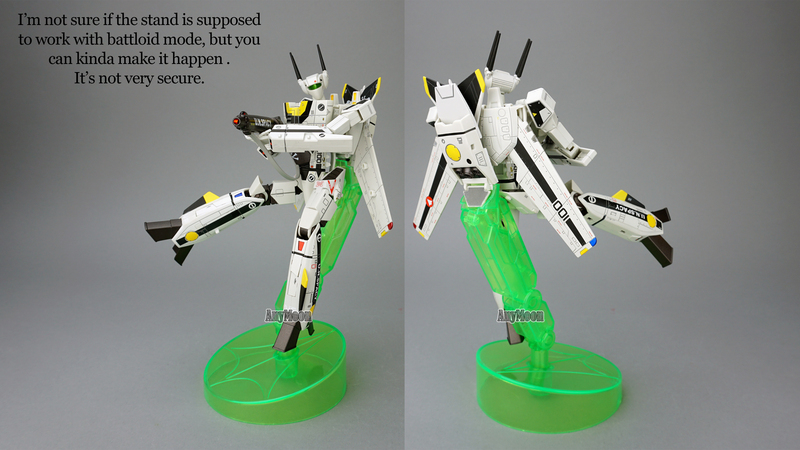 Partially because of those issues but also because of the shoulder placement, Guardian mode was a weakness. 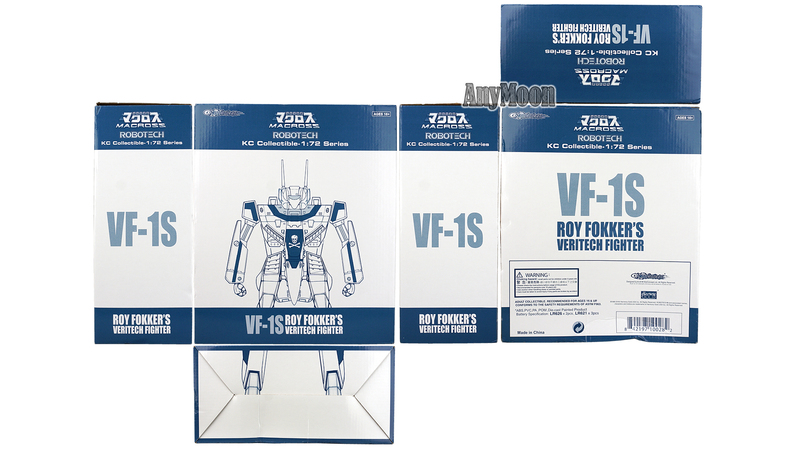 Where this toy really falters is in the build tolerances so hopefully they can do a lot of fine-tuning before the next release. 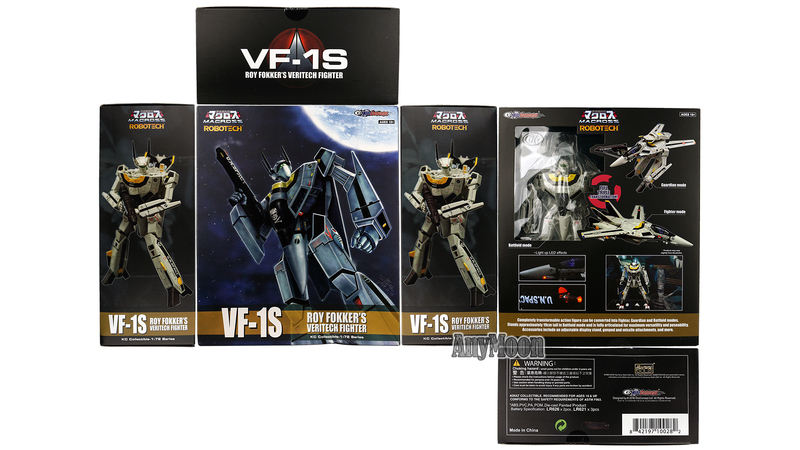 If they can pull that off, this will become a very exciting line of toys to own at a very competitive price. In the meantime, now that you know the major weaknesses, you may still find the toy quite fun just sticking to its strengths. Updated: February 10, 2019 – Added 4K review and a few additional pictures.